It all comes down to this. After more than a year on the road, the Rising tour pulls into New York City on Wednesday for its last stand at Shea Stadium. We've got plenty of visions dancing in our heads, thinking of the "Dirty Water"-style local-special possibilities: the Beatles come to mind first, of course ("I Wanna Hold Your Hand" to open the stand?) but bands besides the Fab Four have played Shea over the years. The Clash opened for the Who; the Rascals (a Little Steven fave) played their final concert there. In a different time, Grand Funk Railroad accomplished something Springsteen has not: they sold out Shea Stadium. Fast. (How about "We're an American Band" in tribute?) Then there are the local heroes: the home of Louis Armstrong is just a few blocks away; Woody Guthrie lived in Queens for years ("Vigilante Man" anyone? ); and don't forget the favorite sons of Forest Hills  no, not Simon and Garfunkel, but the Ramones. Open with "Rockaway Beach"? Close with "I Wanna Be Sedated"? Have Steven sing "Teenage Lobotomy"? The possibilities are endless. Real World - We've been dying to hear this one solo-piano again, a la the Christic shows. But we'll take it any way we can get it. The Price You Pay - Last performed in 1981, we thought that this would be a natural for the Rising tour. It's not too late. Open All Night - Nebraska has been woefully under-represented since the E Street Band reunited, and while "Atlantic City" is always a crowd pleaser, that album runs deep. "Yeah, but in a stadium?" Hey, it worked in '85. This one would hum like a turbo jet. New York City Serenade - It's midnight in Queens, this is no time to get cute. I Wanna Be With You - A great mission statement from the band that opened a few Reunion tour shows; some songs from Tracks don't always connect with a big crowd, but this one is irresistable. Roulette - Like "Trapped," an intense, dark-themed rocker that would be welcome every night. Stolen Car (Tracks version) - Springsteen has looked back on "Stolen Car" as pivotal to his songwriting trajectory; the heartbreaking arrangement on Tracks, with accordion and mandolin, cries out for a full E Street Band performance. The E Street Shuffle - Sparks fly when this moves on up to the setlist. None But the Brave - In the out-of-left-field tradition of "County Fair," this never-performed, never-released anthem would work on many levels. Hey, you didn't think he'd play "Cynthia" either. The fun begins on Rocktober 1. If you're still looking for tickets, or if you can't make it and want to follow the setlists live, be sure to pay a visit to BTX. Be sure to check out the Mets website for official show information, directions, tailgating (or lack thereof); read New York Newsday's "Shea Preps for The Boss" for info on preparations and other details. If you've read the latest issue of Backstreets magazine, you already know plenty about photographer Frank Stefanko. The short version: Frank was introduced to Bruce by Patti Smith in 1978, leading to a five-year photographic collaboration through the Nebraska period. "The pictures were raw," Springtseen writes in his introduction to Frank's new book, "Their directness, their toughness, were what I wanted for my music at that time." Stefanko shot thousands of photos of Bruce and the E Street Band from 1978 to 1982  you've seen 'em on the covers of little records like Darkness on the Edge of Town and The River, and elsewhere  but he has never published from his archives until now. For fans of Frank's work, and of this period of Springsteen's career, there's now a pirate's treasure. Stefanko's gallery show is up now at Govinda Gallery in Washington D.C. (1227 34th Street NW). Running through October 18, the show presents stunning, never-before-seen prints from Frank's sessions for Darkness, The River, and Nebraska. After several dumbstruck hours standing in the gallery and drooling, we can't say enough good things about the show; if you're anywhere near the D.C. area, it's well worth the trip. For more information and some online images, visit the Govinda Gallery website. The Govinda show celebrates the publication of Frank's new book, Days of Hopes and Dreams: An Intimate Portrait of Bruce Springsteen. The book, available now, presents 88 color and B&W photos from Stefanko's archives, along with commentary he wrote for the book and an introduction by Springsteen himself. Get your copy from Backstreet Records! We have it in stock now, and we always appreciate your support. For more on Stefanko, Backstreets #77 has a lengthy exclusive interview with the photographer about his time collaborating with Springsteen, along with color shots that you won't find elsewhere. BORN TO RUN: "BEST" ALBUM OF "ALL TIME"! Remember the Zagat music survey in the works that we linked to earlier this year? Well, it looks like everybody played their part: it was announced today that Springsteen topped the poll. Born to Run ranked as the number one most popular album in their survey of the top 1,000 albums of all time. (Again we say: happy birthday, Bruce.) Springsteen had two albums in the top ten, with Darkness coming in at number seven; he and the E Street Band came in at #8 on their list of the most influential artists. This is Zagat's first Music Guide; read more at CNN.com or Billboard.com. 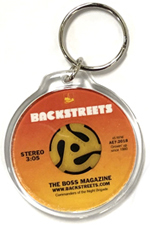 Order the Zagat Music Guide from Backstreet Records (but remember, if you took part in the survey, they're supposed to send you one for free). Born September 23, 1949, Bruce Springsteen turns 54 today. And still hanging upside-down on mic stands! Happy birthday, Bruce, and here's to many more. GONE WITH THE WIND: WARREN ZEVON, R.I.P. Well, he knew it was coming; we knew it was coming; that doesn't make it any less of a loss. Warren Zevon passed away on September 7 at his home in Los Angeles, over a year after being diagnosed with mesothelioma, an inoperable form of lung cancer. Zevon did get to see the release of his final album, The Wind, less than two weeks before his death. It's a hell of a parting shot. Many of Zevon's friends and past collaborators contributed to The Wind, including Bruce Springsteen on "Prison Grove" and the roadhousin' "Disorder in the House." (Springsteen and Zevon previously collaborated on "Jeannie Needs a Shooter," released on Zevon's 1980 album Bad Luck Streak in Dancing School). VH1's recent program (Inside)Out: Warren Zevon, chronicling his race to finish The Wind, re-airs several more times  check RockOnTV.com for dates and times. And, as Warren himself said last October, "enjoy every sandwich." Read Mitch Albom's "Singer Zevon's Life Anything But Gray." Read Dave Barry's "Warren Zevon, acclaimed singer-songwriter..."
Braun: Des'ree's "You Gotta Be"
Edwards: John Cougar Mellencamp's "Small Town"
Lieberman: Fleetwood Mac's "Don't Stop" and Sinatra's "My Way"
Gephardt: "Born in the U.S.A."
Graham: Jimmy Buffett's "Changes in Latitudes, Changes in Attitudes"
Just doing our best to stay vigilant here. Bruce Springsteen is set to get Sony's "Essential" treatment, with a two-disc best-of compilation due on November 4. Do we really need another Greatest Hits collection for Springsteen? Considering that the 1995 offering doesn't include a song like "Rosalita," one could easily argue yes. A double-CD set can paint a fuller picture of Springsteen's career. But what should keep diehards happy about the two-disc release is... the third disc. That's right, Sony is planning a limited run of The Essential Bruce Springsteen to be packaged with a bonus disc of rarities: some hard to find, some previously unavailable on CD, some previously unavailable, period. Let the speculation begin... As with all things Bruce, we'd be wise to consider this subject to change; but that's Sony's current plan for a November 4 release. No track listing yet, but any and all new info will go right here. October 4 has just been added as the third and final date at Shea Stadium, where Springsteen and the E Street Band will play for the first time for their world tour grand finale. The official Shea dates are now October 1, 3, and 4. Tickets for the October 4 show go on sale Wednesday, September 10 at 10 a.m., through Ticketmaster charge-by-phone and www.ticketmaster.com. According to Springsteen's publicist, Shore Fire Media, October 4 "will be the last show of Springsteen and the Band's 2002-03 world tour... No additional dates will be announced." Manager Jon Landau says, "Over the last 30 years, New York has been central to Bruce's performing career. He played on the same bill with Bob Marley at Max's Kansas City in 1973, did his legendary Bottom Line shows in New York in 1975, played Madison Square Garden for the first time in 1978, and ended his 2000 tour with the E Street Band with ten shows at Madison Square Garden. So, it's extraordinarily appropriate that the grand finale of this most successful of all Bruce Springsteen and the E Street Band tours will take place at New York's Shea Stadium. I'm sure they will be nights to remember." For the complete upcoming tour schedule and additional on-sale information, go to our Tour Schedule/Ticket Info page. Springsteen and the E Street Band play Fenway Park this weekend. Toughest ticket of the summer tour? Well, we'll see how the Shea ticket sale goes, but right now we'd have to say yeah. If you're lucky enough to be a Fenway show ticketholder, you won't wanna be late: check out boston.cc.com for directions, parking information, and additional details. And as the ballpark prepares to host the show, check out this Fenway webcam to see where things stand this very moment. And in the Boston Globe, critic Steve Morse runs down his "top 10 list of Springsteen shows that have helped make this job so worthwhile." The September 20 Buffalo show has had sluggish ticket sales, and something had to give. Don't worry, it's still on, but the venue has been downsized from Ralph J. Wilson Stadium to Darien Lake Performing Arts Center. Important info from Ticketmaster: "Refunds are available point of purchase or original tickets should be exchanged for Darien Lake PAC tickets. Internet orders for this show that were in the Pit or Field level will be exchanged for Pit or Reserved seats at Darien Lake. Orders that were in the 100 or 200 level for this show will be exchanged for lawn tickets for the Darien Lake show." The Darien Lake PAC show goes onsale this Saturday, August 16th, at 10 a.m. Please contact Ticketmaster for any additional information. In between the E Street Band's 8/11 Philly show and the 8/13 Chicago show  y'know, on his day off  Nils Lofgren sat in with Bob Dylan at the at Hammerstein Ballroom in NYC. Not just for one or two songs: Nils took the stage a few songs into the show and jammed with Dylan for the rest of the night. On newer songs like "Summer Days" and "Honest With Me," older songs like "Highway 61 Revisited" and "It's All Over Now, Baby Blue," through the encores "Like a Rolling Stone" and "All Along the Watchtower." As one eyewitness tells us, Lofgren "tore it up: spontaneous, roughshod, garagey, and rockin'." Go Nils! A DRINK AND A DANCE: NEW BRUCE GLASSES FOR "BORN TO RUN"
You might have already seen the "Wild & Innocent" drinking glasses from our friends at Tenth Avenue Productions (we've got a set ourselves here on the kitchen level of the Backstreets Towers). Well, they've got a new line now, the Born to Run collection, with four different designs inspired by "Thunder Road," "Jungleland," "Backstreets," and "Born to Run." Check 'em out at the Tenth Avenue Productions website. This year's Emmy nominations have been announced, with the Bruce Springsteen & the E Street Band CBS special turning up in three categories: "Outstanding Variety, Music Or Comedy Special," "Outstanding Directing For A Variety, Music Or Comedy Program" (Chris Hilson, Director), and "Outstanding Multi-Camera Picture Editing for A Miniseries, Movie Or A Special" (Thom Zimny, Editor). The 55th Annual Primtime Emmy Awards ceremony will be held at the Los Angeles Shrine Auditorium on September 21, to be televised on Fox. Don't look for Springsteen on the red carpet, thoughhe and the band play that night in Detroit. "People come to my shows with many different kinds of political beliefs; I like that, we welcome all. There have been a lot of questions raised recently about the forthrightness of our government. This playing with the truth has been a part of both the Republican and Democratic administrations in the past and it is always wrong, never more so than when real lives are at stake. The question of whether we were mislead into the war in Iraq isn't a liberal or conservative or republican or democratic question, it's an American one. Protecting the democracy that we ask our sons and daughters to die for is our responsibility and our trust. Demanding accountability from our leaders is our job as citizens. It's the American way. So may the truth will out." The night before Springsteen's U.S. tour begins, Pearl Jam wrapped theirs up, right down the road at Holmdel, NJ's PNC Arts Center. And don't think they didn't know they were in Bruce Country. Brian Ives reports: "Opening band Sleater-Kinney did a great cover of 'The Promised Land,' and during Eddie Vedder's solo acoustic segment of Pearl Jam's show, he did 'Growin' Up' for the first time. He said, 'You might be seeing this guy in the next few days...' and talked about how this was a song that he used to play on guitar while he sat on his bed as a kid. Vedder said he'd never played it before in public. He also added, 'I heard that [Bruce] was supposed to play this very venue, but apparently they didn't have 167 open nights in a row.'" After struggling with a brain tumor for the last three years, Phil Ceccola passed away on Sunday, July 13, at the age of 48. Ceccola's are some of the best-known photographs from the beginning of Springsteen's recording career, starting with Bruce’s first gig at the Main Point in 1973, with many striking images from the early-to-mid-'70s. "People often refer to my work as being of Bruce in 'the bearded years,'" Ceccola told Nicole Pensiero in 1999. "I was a just a kid having fun, but he was one, too." 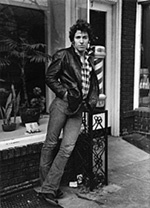 Most visible has been the 1975 photograph later used for the cover of Tracks; his photographs can also be seen in Dave Marsh's Born to Run, Bruce Springsteen's Songs, and the pages of Backstreets. Philadelphia DJ Ed Sciaky, a longtime friend of 30 years, paid tribute to Ceccola last night on his weekly "Sundays with Springsteen" program. "I opened with 'Blinded By the Light,'" Sciaky tells Backstreets, "because that was the song that turned him on to Bruce. Then I played 'Stand On it,' 'My Beautiful Reward,' 'Souls of the Departed,' 'Missing,' and 'You're Missing.' I talked about how Phil used to bring Bruce up to WMMR to be on my show he used to chauffeur Bruce around town in the early days. He got to be friends with Bruce, he used to go hang at his house, and of course he took all these great pictures." There will be a showing of some of Phil's best Springsteen photos beginning August 7 at the Orbit gallery (4312 Main Street, in The Canal House First Floor in Manayunk), with prints available for sale. Proceeds will go to a trust fund set up for Phil's two daughters, who survive him. Read the 1999 City Paper story by Nicole Pensiero: Shooting the Boss: How Conshohocken's Phil Ceccola made it to the Rock and Roll Hall of Fame with his camera. With the Giants Stadium opening night just a little over a week away, a Reuters/Billboard article reports that Springsteen and the E Street Band have sold nearly a million tickets for the upcoming U.S. stadium leg. And that there's more to come: "Additional stadium dates will be announced this month, with the tour expected to end on or around September 30." According to Billboard, the ticket tally for the 2003 European leg came to 1.1 million tickets sold. Manager Jon Landau said of Europe, "We were on fire over there," and described the last European show, in Milan, as "one of the four or five best Bruce shows of all time." For more stats and the current state of the tour, read the full article, All Hail Bruuuce! 15 YEARS AGO: On July 3, 1988, Bruce Springsteen and the E Street Band's Stockholm concert was broadcast live to 15 countries around the world. It was their first live radio broadcast since the Darkness tour, including their performance of Bob Dylan's "Chimes of Freedom" later officially released. Gearing up for the upcoming U.S. leg (which starts in less than two weeks), Little Steven Van Zandt has talked to Billboard.com about the changes in the tour since last time it was on these shores. "It's a very different show than the one we started with," he says, calling Springsteen a "master of spontaneity." Most interesting for fans may be what Van Zandt has to say about the E Street Band's future prospects: "[The] E Street Band guitarist... says the group is 'absolutely an ongoing concern' that plans to continue working once its summer tour concludes. 'From here on in, it will be new stuff, and we're in the active band cycle of album-tour-album-tourI hope forever.'" Steven also talks about the European leg and his own plans for his Underground Garage. Read the full Billboard.com article, "Van Zandt Promises E Street Band Surprises." The Stone Pony is changing hands again. Current owner Domenic Santana, who purchased "The House that Bruce Built" four years ago, has agreed to sell to developers. While many fans remain wary of the sale's fallout, the current plan is for the Asbury Park musical landmark to remain standing. According to an Associated Press story: "Santana said under the sale agreement, developers could still tear down the building or use the name for new club elsewhere in the city. But officials with Asbury Partners, a company overseeing a $1.2 billion makeover of the city's decrepit waterfront, now say they plan to renovate the building, add a new dance floor and keep it where it is." In the Asbury Park Press ("New owners say Stone Pony will not be razed after sale"), Asbury Partners COO Larry Fishman elaborated: "It is our intention to upgrade the facilityput in new air conditioning, a new dance floor, upgrade the rest rooms, the kitchen. We possibly may upgrade the whole building with the intent of using The Stone Pony as a major tourist attraction for people coming to Asbury Park." As Bruce Springsteen and the E Street Band play U.S. Stadiums later this year, a number of new Bruce books will be hitting the shelves. August brings Frank Stefanko's "Days of Hope and Dreams: An Intimate Portrait of Bruce Springsteen," a high-quality book of photographs from 1978-1982. Stefanko shot the album covers for both Darkness on the Edge of Town and The River, and his book will contain many never-before-seen Springsteen photographs from the Darkness, River, and Nebraska photo sessions. Expect approximately 80 photos in all. We're pretty excited about this one, and it seems we're not alone: Springsteen himself has written a foreward for the book. Shortly after publication, an exhibition of Stefanko's work will run at Washington D.C.'s Govinda Gallery, from September 19 - October 18. Also watch for the Backstreets interview with Frank in our next magazine, issue #77. 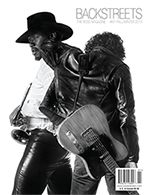 Also in August, HarperEntertainment will issue the first softcover edition of Springsteen's 1998 book, "Songs." A new Dave Marsh title is scheduled for October, called "Bruce Springsteen: Two Hearts." Rather than being a third installment of his Springsteen biographies, "Two Hearts" primarily collects Marsh's two volumes on the Boss, "Born to Run" and "Glory Days," in a mammoth 688 page book. According to publisher Routledge, Marsh does bring the reader up to date with this new softcover edition: "Marsh has written a new chapter covering major developments in Springsteen's career to today, particularly focusing on his album The Rising and its impact on American culture." Also in October, look for a book from DoubleTake Magazine's Robert Coles (a Pulitzer Prize winner and Harvard professor, introduced to many Springsteen fans at the February benefits in Somerville, MA) called "Bruce Springsteen's America: The People Listening, a Poet Singing." A Billboard report, As Tour Ends, Boss Still King of Road, has tour grosses and talk from Jon Landau. Pay a visit to garlandjeffreys.com for one guest's take on closing night at Shea. America's Finest News Source, The Onion, has a Boss scoop. The Boss pays a visit to the Mark Twain House. A fun reflection on listening to Bruce from the Counting Crows' Adam Durtiz on his website. Once you're there, click on the 09.04.03 message. Visit photographer Lynn Goldsmith's PhotoDiary, now online. The second volume of Car Talk Car Tunes is called Born Not to Run, with great parody cover art. Check it out at the Car Talk website. Many from the Springsteen community have banded together to save this Asbury Park landmark. Plans are rapidly taking shape for the demolition of the Palace Amusements complex, to be replaced in part by a new structure which owners say would be built "in the spirit" of the original. Check our Save Tillie page for new developments on the fate of the Palace, and what you can do to help. Check out the Springsteen Special Collection page for more info, including a list of the Collection's top ten "wants" for September.